By Garett Sloane . Published on August 31, 2016. 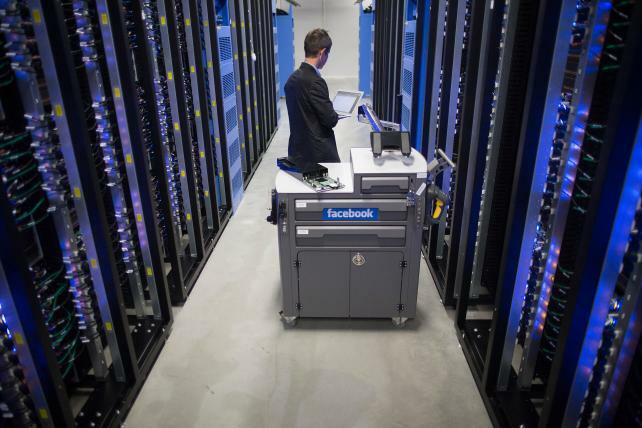 An employee inspects a tool and maintenance box, also known as a 'crash cart,' between server racks at Facebook's data center near the Arctic Circle in Lulea, Sweden. Facebook wants advertisers to get faster. The social network is going after one of the biggest concerns in mobile advertising by telling brands to build better mobile web experiences that load more quickly. Facebook has repeatedly found that people don't stick around for pages that take too long to display -- 40% click away if a page takes three seconds to load, according to Facebook. On Wednesday, to speed up the process, Facebook said it was introducing new technology that "pre-fetches" the contents of an advertiser's mobile website, meaning it stores its contents in Facebook servers for faster access when a consumer clicks on the ad. Facebook could even prevent ads from showing to someone if the website it leads to is too slow and not optimized for mobile, said Matthew Idema, Facebook's director of ad products marketing. "The speed with which a mobile website will load is one factor our ad delivery system will use to determine which ads to show which people," Mr. Idema said. For this reason, Facebook also shared guidelines on how advertisers can develop faster web pages, including using smaller files and less code in their sites. The web speeds are a factor only in campaigns that invite users to click to a business's website. Facebook has been on a speed kick all year, introducing Instant Articles, which let publishers host stories on its servers so they immediately load upon clicking. It also developed Canvas ads, which are fast-loading multimedia mobile ads, an experience that takes up the full mobile screen and one that Facebook calls "immersive." It's not alone, however, in this crusade. Google also has altered its mobile search product to favor mobile-optimized sites. It also has an Instant Articles rival called Accelerated Mobile Pages for publishers. Top media sites also have been pushing advertisers to consider speed on the mobile web, according to Jarrod Dicker, Washington Post's director of ad product and engineering. The Post has built ads with multimedia components that it hosts -- pre-cached -- on its servers to enable faster responses after someone clicks. The Post uses a new platform it calls Fuse for its high-speed ads. "The users have been trained that if an experience isn't fast it's OK to leave or to bounce," Mr. Dicker said. "Advertisers need to take their creative and their message and make it as fast as possible."